Over the course of the two-day gathering, our diverse group of attendees shared amazing stories about their efforts on the cutting edge of care. We swapped tips on new ways of getting our work done and collaborated on building a better future. There is no magic bullet for creating a successful partnership. Often it requires the right environment, people, and personalities. However it starts with a shared goal and an openness to understanding how each partner can contribute to reaching this shared goal. By creating a trusting environment, partners can continue to provide feedback about what is working and not working. The Nonprofit Finance Fund taught us what makes partnerships stick and thrive. Relationships — What is our shared goal? How do we complement what we bring to the table as two different organizations? How are we as two different entities going to work together? Service Delivery and Workflow — What is the work we are going to do together going to look like? Funding and Finance — Where will the money come from? Data and Outcomes — How are we collecting and sharing data? What will success look like? How will we know this partnership is working? To better understand progress toward benchmarks characteristic of effective partnerships, identify areas for further development, and guide strategic conversation, download and fill out the tool. And review the fund’s full presentation. An Expert Citizen is an individual trained (or with experience) in a specific discipline. A Citizen Expert is an individual armed with the experience of living or working in a specific community. People actually tend to make very logical decisions, and it’s our job to understand the decisions and ensure that solutions address their realities. In health care, we, the Expert Citizens, like to think we are taking patients and their families into account; but are we really tailoring what we do to fit their needs? Patients, or Citizen Experts, aren’t just groups of people we pull in when we need feedback on a project or idea. We should be co-designing with these knowledgeable authorities on everything, from health issues to community problems, each and every day. In fact, that’s how the Downtown Women’s Center and JWCH Institute developed DiaBEATit, an all women’s diabetes prevention walking group. By interviewing and engaging women with lived experience, what really came through was the trauma and discomfort of living in the Skid Row community of Los Angeles. So this partnership created DiaBEATit to provide homeless and low-income women a safe way to exercise. In addition to getting hearts pumping and legs moving, this walking program has since exposed participants to local resources for healthy food, such as farmer’s markets and community gardens. It’s also become a supportive environment to learn about diabetes, establish exercise goals, and make friends. Participants have already seen significant improvements in their body mass index (BMI), blood pressure, and A1c screenings. Read more about the full impact by downloading their slides. Historically, drug addiction has been seen as moral failure of the individual. But it should be viewed as a chronic brain disease, according to Tenderloin Health Improvement Project’s workshop. Like asthma and diabetes, addiction is a progressive, relapsing disease. It is triggered by a combination of behavioral, environmental, developmental, social, and genetic factors. And it affects individuals who may have difficulty complying with the prescribed treatment. The Tenderloin Health Improvement Partnership panel also encouraged us to “talk ugly.” When building this multi-sector collective impact partnership, it was important to sit with the discomfort of talking through the unspoken, but very present, stigma about opioid addiction. If not now, allies reasoned, then when are they ever going to break through? They emphasized that they would never scratch the surface of improving the health of their neighborhood if they were not truly honest in their exploration of the problem. Politeness wasn’t going to get them anywhere. Similarly, we learned the importance putting yourself into the position of vulnerability during a session led by Kokua Kalihi Valley (KKV) Comprehensive Family Services. Our Hawaiian teachers led activities centered around touch and invoking our ancestors. While this sometimes felt uneasy — especially for those of us who aren’t naturally touchy people and don’t openly talk about our families — it made us question what is “normal.” We realized what we may consider “normal” practices are probably completely unfamiliar to people from different backgrounds and cultures. It’s OK to feel uncomfortable — it’s all part of the learning process! Kokua Kalihi Valley (KKV) Comprehensive Family Services’ learning exchange also taught us how to become more human- and community-centered in our research and impact assessments. KKV is part of a culture rich in story, and preserving ancestral stories is a vital part of KKV’s community work. So instead of having outside ethnographers conduct research and evaluate the impact of their programs, they send young community members into the field to listen to people’s stories, code the stories, and identify patterns between today’s stories and those stories told by their ancestors. Moreover, there’s power in compassion, and it takes compassion and patience to build trust in our relationships. KKV is grappling gentrification, refugee crises, and access to healthy food. But in the face of these challenges and others, KKV showed us that we can always step up and make people feel connected to their community through land, food, and a deep sense of gratitude. Learn more about creating an indigenous framework of health by downloading KKV’s presentation. Our keynote speaker was Toyin Ajayi, chief health officer of Cityblock. Part of her talk was dedicated to discussing financing, sustainability, and how health care has recently “discovered social determinants like we’re discovering water for the first time.” When one of our attendees asked how to maintain this work, Toyin, in her reply, questioned how you could build a culture of health and wellbeing on a one to two year grant cycle. In order to figure out how to do this work well, nonprofits and health care organizations need to be given the space to experiment, innovate, and, most importantly, fail. We also loved that Toyin Ajayi talked about equity vs. equality, as it’s something on all of our minds. It may feel really weird to treat people differently because of who they are or their circumstances. But if you don’t recognize people’s context and individual challenges, then you’re not helping. 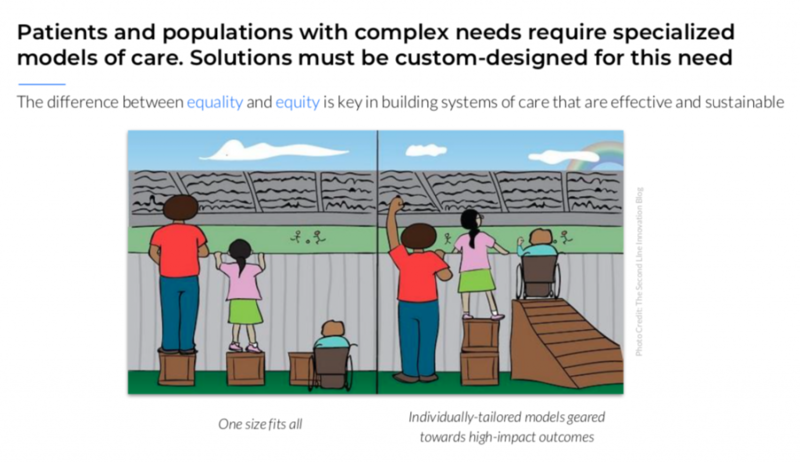 Providing equal treatment and care for all populations won’t solve health disparities. Toyin Ajayi told the story of Patti, a 41-year-old single mother. She suffered from severe asthma and didn’t have a steady job. She had multiple allergies, PTSD, and depression. She was managing 10+ prescriptions and used pain pills and street drugs. “It feels incredibly personal to see a person suffer like this,” said Toyin. These are the stories we all carry with us as we try to innovate and transform health and health care. It’s these stories that push us to create interventions that will change lives for the better. For City of Hope, a picture was worth a thousand words. In partnership with City of Duarte, and the Duarte Unified School District, City of Hope implemented “photovoice,” a type of participatory action research in which people — usually those with little power — photograph their environment and experiences to express their own stories. Through its Teen Nutrition Council program, local teens photographed positive and negative health impacts in their community. Then they used those pictures to advocate for change. A presentation of their work prompted the city to remodel Aloysia Park, a worn down and unwelcoming playground spotlighted by photovoice. Today, the new play structure is much safer and vibrantly colored. BBQ grills and picnic tables allow families to to enjoy a day in the park together. There are also several adult fitness areas, where parents can exercise while watching their kids play. Hennepin Healthcare and Roots Community Clinic are separated by thousands of miles. But both organizations came to the conclusion that employment pathways enhance patients’ independence, self-confidence, and sense of purpose, while also benefitting the community at large. And both engaged patients and community members in the creating these new job opportunities. Hennepin used human-centered design to create a vocation rehabilitation program that teaches job-seeking and financial skills, while connecting patients to relevant paid and unpaid opportunities. Learn more about the initiative by downloading the presentation. Roots launched a soapmaking social enterprise that combines on-the-job training with whole-person support for formerly incarcerated individuals. Its “secret sauce” is patient navigation — about a third of the clinic’s 60 staff members are navigators who are deployed to assist patients during three major points of transition: (1) when people either become unhoused or housed; (2) when they are released from prison, and (3) when they’ve newly immigrated to an area. Dig deeper into this social enterprise by reading the Roots’ presentation. We say all the time that we need to walk the talk. We need to apply human-centered design to our own work in strengthening teams and reducing burnout — especially when we’re busy and overwhelmed.